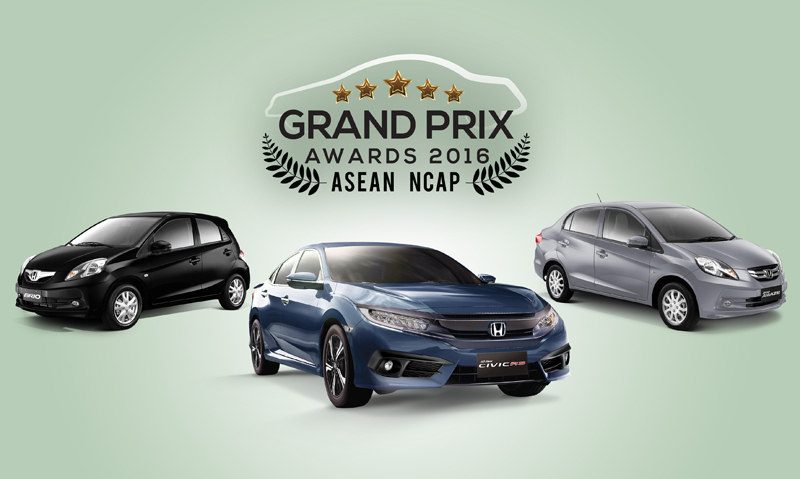 Honda dominated the recent ASEAN NCAP Grand Prix Awards held in Malaysia after winning ten (10) distinguished awards in three different categories. Honda received two (2) awards in the Crash Worthiness Performance category; one (1) award in the Safety Technology category; and seven (7) awards in the Most Affordable 5-star Car in ASEAN category. The All-New Civic achieved a remarkable 5-star rating in both frontal offset impact and side impact tests, with scores of 14.74 out of 16.00 for Adult Occupant Protection (AOP) and 86% for Child Occupant Protection (COP). With this achievement, the All-New Civic reigned as the “Best Medium Family Car in AOP” and “Best Medium Family Car in COP” under the Crash Worthiness Performance category. These awards truly highlight the excellence of the All-New Civic’s host of safety features. The All-New Civic is equipped with driver and passenger SRS airbags (with side and side curtain airbags for the RS Turbo), Vehicle Stability Assist (VSA), Hill Start Assist (HSA), Anti-Lock Braking System (ABS), Emergency Stop Signal (ESS), Multi-view Reverse Camera with Dynamic Guidelines, Seat Belt Reminder, ISOFIX and Immobilizer. The All-New Civic is also integrated with Electric Parking Brake (EPB), and Auto Break Hold (ABH) features. Under the Safety Technology category, the Honda SENSING received the “Best Safety Technology from a Car Maker” award. Honda SENSING is a system that recognizes the driving environment, intentions of the driver, and conditions of the vehicle. Key Honda SENSING functions include Collision Mitigating System (CMBS), Lane Keeping Assist System (LKAS), Road Departure Mitigation (RDM) with Lane Departure Warning (LDW), and Adaptive Cruise Control (ACC). Some of these features are equipped in the locally available All-New Pilot and New Legend. Under the Most Affordable 5-star Car in ASEAN category, the Jazz was classified as the “Most Affordable 5-star Car in the Philippines”, while the City, BR-V, and HR-V won the category in other ASEAN countries. Along with these several outstanding awards, both the Brio and Brio Amaze also achieved a 4-star rating in the ASEAN NCAP crash test. The Brio Amaze showcased its above class safety features, and scored 12.88 out of 16.00 for AOP, and 45% for COP. Honda’s achievement underlines its dedication to continuously promote safer driving, and a collision-free society for everyone sharing the road. With a global safety slogan of “Safety for Everyone”, Honda will strive to constantly manufacture and develop safe and reliable vehicles to realize a mobile society with no collision. The ASEAN NCAP (New Car Assessment Program for Southeast Asia) is an addition to the NCAP programs. It aims to evaluate safety standards, raise consumer awareness, and encourage a market for safer vehicles in the ASEAN region. The ASEAN NCAP collision tests are conducted as collaboration between ASEAN NCAP and the Japan automobile Research Institute (JARI). Please visit www.aseancap.org for more information regarding the ASEAN NCAP. For more information on Honda and its complete model lineup, visit any authorized Honda dealership nationwide or www.hondaphil.com.